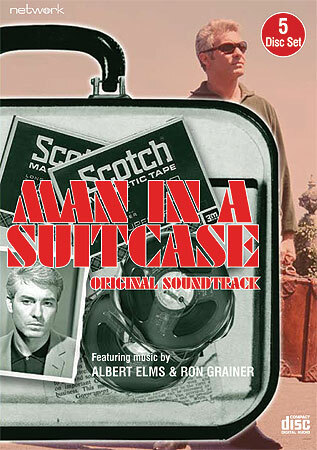 The twelfth Soundtrack of the Week is this 5-CD set of music from the British TV show Man in a Suitcase. This is courtesy of the freaks at Network DVD, who also released 3-CD sets of music from The Prisoner and music from Randall & Hopkirk (Deceased). The same people responsible for the music from The Prisoner did the music for Man in a Suitcase, and if you like the Prisoner music, you will like this. I think my favorite cues are those for the "Brainwash" episode: crazy, psychedelic ensemble playing. "The Bridge" has some great cues for various "hooligans". "Castle in the Clouds" seems to quote "Fly Me to the Moon" here and there.